The ATA is designed for the ES,YM,NQ and TF. I received a lot of emails asking if it will be effective with other markets. Here is a partial email from an overseas trader. "Lots of work left to do on fine tuning and walk forward testing for these Asian indices Al, but first reactions on the signal quality…impressive. 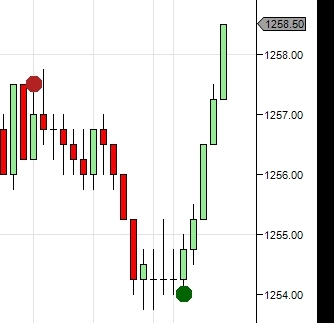 The DAX signals from the last few days were closer to your ES screen shots.﻿"
What is the ANDREA TRADE ALERT (ATA). The ATA came about from a recommendation from my wife Andrea. She suggested that it may be easier for some traders to take entries if they had some type of an alert to let them know when the possibility of an entry was imminent. I realize that many traders, no matter what method they are attempting to learn, seem to have some difficulty in recognizing an entry or they may display some hesitation in taking a trade when an entry does set up. So, the goal of the ATA is alert you when a trade sets up as well as assist in building the confidence needed in order to take the entries. Actually, trading with the ATA should not only assist a trader in taking entries but also make it possible for a trader to actually understand what he or she is doing, and why. So, what is "behind the scenes" of the ATA. Well, it is not moving averages, CCI"s, MACD,s , RSI,s or any type of indicator entry. Over 90% of traders who use indicators will NEVER be profitable on a consistent basis. The ATA is based trading behavior. People are creatures of habit and traders are people. I talk about this a few places on this website. As much as one may think this is crazy, there is no way to get around it. This is the way the market trades. The market is NOT chaotic. There is a reason for everything. There are definite entry points and definite targets. I spent years, as did many of you, attempting profitability from indicators. Without going into a long dissertation about what I went through, which mirrors many of you I am sure, I discovered something. PREDICTABILITY. ATA is based on predictability. Just look at the screen shots. Now, are all entries similar to what I have posted? Not all, but we have rules, not many, just a few. With the ATA study, you will receive documentation that explains our entries. These rules are logical. You just need to follow the rules. Not always an easy task. I was a teacher for 41 years, high school and college, and I am well aware of this. But, following rules is a must. A purchase of a car does not mean that you can go thru red lights and stop signs or drive on the wrong side of the road. What charting do I need? The ATA is available for NinjaTrader 7. Once purchased, you will receive, via email, the study with complete instructions on how to add the ATA to your charts. Not difficult at all. You will also receive documentation explaining, in as much detail as possible, how to trade the ATA. How does the ATA work? When a long setup develops, a green dot will appear. The trade is taken 2 ticks, no more than 3 ticks from this dot. 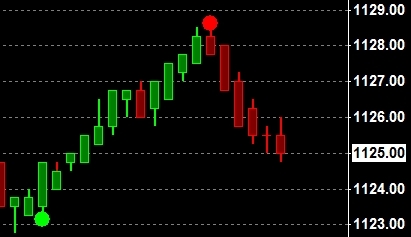 When a short setup develops, a red dot will appear. Take the entry 2 ticks, no more than 3 ticks from the dot. The screen shot above shows a long and short as an example. But, the color of the dot is not what is important, it is the entry when a dot appears. Actually, all dots can be the same color. Yes, all of our screen shots are real setups. There is a specific manner in which an entry is taken when a dot appears, depending upon when and where it appears. This is all explained in the documentation included with the ATA. What stops do you use? If you take the entry 2 ticks from the dot, I recommend a 4 to 5 tick stop. If you take the entry 3 ticks from the dot, I recommend a 5 to 6 tick stop. The targets vary for each trade. To say that you always have a 2 point or 3 point target when a trade sets up is just ridiculous. This is one reason why many traders get stopped. The market dictates the targets, not the trader. Can the ATA be used for only the ES? The ATA will work very well for the NQ,YM,ES and TF as well as any liquid market. Will I be able to see the coding of the ATA, or share it with a fellow trader? Nope, you will not be able to reverse engineer it and is licensed for your computer only. If I am interested, or have questions, what do I do? Go to the contact page and email me. Include your phone number if you want me to call you. I will also email you my phone number if you prefer to call me. Copyright © 2019 Eminiscalp.com All rights reserved. U.S. Government Required Disclaimer - Commodity Futures Trading Commission Futures and Options trading has large potential rewards, but also large potential risk. You must be aware of the risks and be willing to accept them in order to invest in the futures and options markets. Don't trade with money you can't afford to lose. This is neither a solicitation nor an offer to Buy/Sell futures or options. No representation is being made that any account will or is likely to achieve profits or losses similar to those discussed on this web site. The past performance of any trading system or methodology is not necessarily indicative of future results.﻿ Any and all trades and setups mentioned in this website, www.eminiscalp.com, are either hypothetical or are taken in simulated mode.